Judith Frizlen has created a wonderful companion to Words for Parents! A mother, teacher, writer and champion of early childhood education, Judith founded the Rose Garden Early Childhood Center in Buffalo, NY. 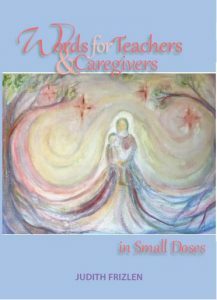 Words for Teachers and Caregivers in Small Doses is a gem, offering words of wisdom to guide you through each week of the year. Click here to read a few pages of the book. To listen to an interview with Judith, click here. simple suggestions to align our self with these natural rhythms. This fundamental alignment is vital for caregivers and teachers of young children. Guided through the year by Judith’s kind hand, we live into the knowledge that we and the children we care for are an integral part of life’s luminous tapestry of transformation. – Sharifa Oppenheimer, author of Heaven on Earth: A Handbook for Parents of Young Children; How to Create the Star of Your Family Culture: The Heaven on Earth Workbook, and What is a Waldorf Kindergarten? Many thanks to Judith Frizlen for creating a book that is both spiritually evocative and super accessible. This is a perfect spiritual guidebook for busy teachers and caregivers who wish to generate a deeper connection to their vocation. What a treasure for teachers and caregivers of young children! This guidebook through the year will infuse your life with joy and purpose, transforming the physical work of caring for little ones into soul work for the adult.